(Washington Times) In a White House often accused of being stacked with loyalists, President Obama’s national security adviser said Wednesday there are too many white people in key government posts, endangering national security because they think alike. The city of Ferguson, Missouri, swore in its first-ever African-American police chief this week, confirming one black leader’s suspicion about the way liberals intended to exploit the killing of Michael Brown. Delrish Moss, a veteran of the Miami, Florida, Police Department, replaces Tom Jackson, who resigned last year after the U.S. Justice Department issued a blistering report on the practices of the Ferguson Police Department. The DOJ report scolded the Ferguson PD for harboring a bias against black residents, using excessive force and focusing their efforts on generating revenue, among other things. The DOJ released another report the very same day, concluding that Officer Darren Wilson was not unreasonable when he used deadly force against Brown. However, they did not let Wilson’s innocence stop them from demanding numerous changes in the Ferguson PD, including the hiring of more racial minorities. Colin Flaherty, a reporter who documented numerous examples of black violence in his book, “White Girl Bleed a Lot,” scoffs at the notion that Ferguson police officers should be on thin ice. He pointed out violent and property crimes in Ferguson are largely committed by blacks. 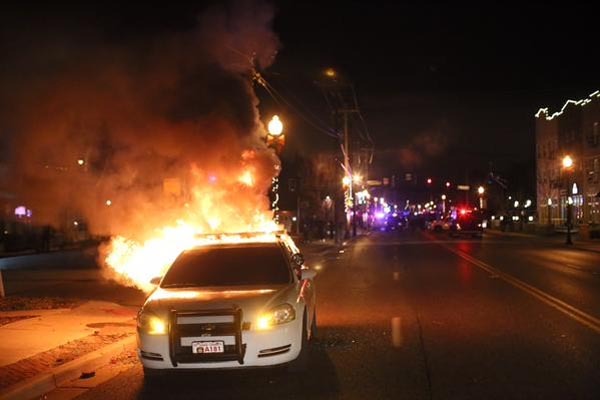 “This entire episode is based on one false premise: that cops are causing the crime in Ferguson,” Flaherty told WND. “That is a lie, part of the greatest lie of our generation, the hoax of black victimization. Police are the good guys – even if they ask black people to obey the law. Peterson, a WND columnist and author of “The Antidote: Healing America From the Poison of Hate, Blame, and Victimhood,” agreed with Flaherty that Moss should not treat his officers like the bad guys. And he fears crime will only get worse with a liberal black chief in charge. “Now that they’re putting this liberal police chief in there, things are not going to get better; it’s only going to get worse,” Peterson warned. “There are black liberal Democrats running the urban areas around the country – city councils, police departments, mayors – and urban areas are absolutely out of control. Moss told CNN he was driven to become a police officer because of two encounters he had with Miami police as a teenager. One time an officer searched him and called him the N-word while he was walking after dark, and another time an officer jumped out of his car and frisked him without warning. So he decided to become a policeman to provide better service to his community than he was getting, and he later sought a high-ranking position to fire bad cops like the ones who abused him, according to the Chicago Tribune. But Peterson doesn’t believe Moss’ background makes him the right person to turn Ferguson into a less violent city. “You might not hear as many blacks complaining about racism now that they have a black police chief in there, but you’re not going to see the crime go down, you’re not going to see violence ending, you’re not going to see a safer and better community as a result of having a black police chief,” Peterson said. Flaherty likewise said Moss may be more popular with black residents, but only if he proves to be soft on black crime. At his introduction, Moss spoke of the need to bring “nobility” back to police work. Peterson disputes the idea that police ever lost a sense of nobility in the first place. In talking about why Moss was the best choice for police chief, Ferguson City Manager De’Carlon Seewood emphasized Moss’ public relations acumen. But Peterson said the city has its priorities in the wrong place if it wants to focus on messaging rather than enforcing the law and protecting residents from criminals. Two Cleveland, Mississippi, schools which are only 40 percent white have been ordered to forcibly mix with neighboring 99 percent black schools—because the US Department of Justice still thinks they are too white. Brown ordered the district to merge East Side High, where all but one student is black, with Cleveland High, where 48 percent of students are white and 45 percent are black. Similarly, the district must merge D.M. Smith Middle, where all but two students are black, with Margaret Green Junior High, where 41 percent of students are white and 54 percent are black. Across the entire 3,700-student district, only about 29 percent of students are white and 67 percent are black. The state counts the remainder as Asian or Hispanic. “The court concludes that the continued operation of East Side High and D.M. Smith as single-race schools is a vestige of discrimination and that, therefore, a plan which allows such continued operation must be rejected,” the judge wrote. Jamie Jacks, a lawyer for the district, said school board members believed they proposed constitutional options to keep open two high schools, although one local plan would have combined middle schools. The school district presented expert testimony that white parents were likely to flee to private schools. Beyond Cleveland, only four of 22 other districts in Mississippi’s Delta region have student bodies less than 80 percent black. “Six decades after the Supreme Court in Brown v. Board of Education declared that ‘separate but equal has no place’ in public schools, this decision serves as a reminder to districts that delaying desegregation obligations is both unacceptable and unconstitutional,” Deputy Assistant Attorney General Vanita Gupta, head of the Justice Department’s Civil Rights Division, said in a statement. In her ruling, Judge Brown also ordered the parties to submit a proposed timeline to implement the plan in such a way as to ensure the immediate termination of the school district’s dual system. She set the deadline for no later than 21 days from the entry of her opinion, which was issued at the end of last week. The ruling is the clearest indication yet that the establishment has no interest in “integration”—because whites are already a minority in the Cleveland schooling system—but rather in exterminating whites completely. Hillary Clinton and Barack Obama want us to believe that the disappearance of American jobs in “the new global economy” is as inevitable as the sun rising in the east. In fact, the radical left planned the liquidation of white, blue-collar working families in order to “fundamentally transform” America. The story begins in the 1960s with the rise of the “youth culture” and the New Left, student activists who were smoking dope, taking over college buildings and sporting Che Guevara T-shirts and Viet Cong flags while protesting the Vietnam War. The New Left sneered at white, blue-collar men as racists and the labor unions that represented them as bastions of white privilege that must be destroyed. After all, it was AFL-CIO construction workers who beat up anti-war protesters in the Hard Hat Riot of 1970, and white working-class voters were George Wallace’s base in his bids for the presidency. Following the bloody riots at the 1968 Democratic convention in Chicago and the Democrats’ subsequent loss to Richard Nixon, the radical left captured the Democratic Party. Their first order of business was to purge men who work for a living from positions of influence in the party, though they had been the muscle of Democratic power since Franklin Roosevelt. The far left executed its takeover through the McGovern-Fraser Commission, formally known as the Commission on Party Structure and Delegate Selection. The new rules eliminated blue-collar men and replaced them with upper-middle class activists whose agendas revolved around campus issues of abortion-on-demand feminism, environmentalism and affirmative action, rather than working people’s concerns of decent pay and decent jobs. The director of the AFL-CIO’s political arm saw what was coming and said, “We aren’t going to let these Harvard-Berkeley Camelots take over our party.” He was wrong. They did. The Democratic Party’s new bosses were born of and members of the privileged professional class. They saw a future where no one toiled in factories, where the entire country would be like them – college educated “symbolic analysts” who work with their heads, not their hands. This is the “post-industrial new economy” the Clintons and Obama tout as “inevitable,” though it’s actually a social engineering experiment on an unprecedented scale. The party cadres set out to build their brave new world and eliminate their class enemies – read: white working people. It is in this context that we understand why Clinton and company push so-called “free trade” deals like NAFTA and Obamatrade, corporatist schemes that move America’s manufacturing assets – and jobs – to Mexico, China and elsewhere. If you believe, as do the leftists, that America has more than it deserves and Americans are racists, the global redistribution of our wealth and the death (literally) of white working people is a desired outcome, a feature not a bug. The social engineers of the left found plenty of useful idiots and knowing enablers to help them in their project to fundamentally transform America. Professional environmentalists enthusiastically embraced America’s de-industrialization, though unregulated industries in China and Mexico are far more destructive to air, water, forests and the people who depend on them than any of America’s EPA-supervised factories. Even the tree-huggers who weren’t consciously seeking a return to a pre-industrial era had nevertheless bought into the prevailing “America is bad” mindset of the left. Race warriors, displaying group solidarity or guilt, were pleased to see the jobs of white Americans moving to the Third World. The talk about “raising a billion people out of extreme poverty around the world” ignores the metastasizing cancer of slavery in the export industries of Asia and the wholesale violations of human and property rights by Third World dictators and crony capitalists. Yet the radical left found its most powerful and willing partner in the most unlikely of places: Wall Street. And so, dear readers, that is how the death of American working-class whites was planned by the radical left and carried out with willing executioners at the highest levels of American politics, academia and business. More details are emerging about what was presented at the “White Privilege Conference” held in Madison, Wisconsin, where tax money was spent to train teachers how to annihilate “white privilege” and “white supremacy” in American schools. One session insisted that whites can never be cured of their permanent racist attitudes. On March 30, Breitbart reported on the conference, now in its fifteenth year. Over these years, teachers have been told that whites have been pushing “white supremacy” on kids since the country was created, and that whites are so infused with racism that they aren’t even cognizant of their crimes. The latest conference pushing this propaganda was held in Madison between March 25 and 29. A Wisconsin reporter tried to gain access to the event, but hosts denied him entrance. However, another reporter was able to gain access without being discovered. Nick Novak of Wisconsin’s MacIver Institute attended the event and found in one session that teachers were being told that white people are like “alcoholics” with their racism. They will never be cured of it but will always be racists at heart. Radersma, who is working toward her Ph. D. in critical whiteness studies at Brock University in Ontario, Canada, also trained the attendees to think that all education should be taught with a political agenda. This runs contrary to the excuse that event organizers gave Wisconsin reporter Adam Tobias as a reason to bar him from the event. Tobias was told that the event was “private” and not funded by tax dollars. Therefore, it was not a public, political event open to reporters, they said. The event was held at the Monona Terrace Community and Convention Center and was provided with an $18,375 booking event assistance payment, money that came from a fund drawn from local hotel room tax revenue. Also, several local school districts paid thousands of dollars in registration fees, hotel stays, and transportation costs for teachers and administrators to attend. Those are also tax dollars. Swedish family forced from their home. Government says it’s for immigrants now. Uffe Rustan and his two sons lived in a home they rented in the city of Lidingö which all of them were born and raised in. White children as young as 6 years-old are being separated from non-White students, and put into their own “Whiteness” classes. The Bank Street School for Children in Manhattan, New York city, is putting White children through these classes to teach them that they were born “racist” because they have “European ancestry“. Meanwhile, “kids of color” are put in a “dedicated space” to instill pride in their race. They are also apparently rewarded with special privileges and treats that White students do not get. Administrators at the school tried to justify their anti-White propaganda by claiming that other schools in America do it, and several of them are in New York. Parents say that under the “Racial Justice and Advocacy” education program, teachers are pressuring White children into feeling guilty about their ancestry, by teaching a skewed, anti-White history of America. This is just sick! What kind of a monster brainwashes innocent children to hate themselves?!? Political correctness is a religion, and Whites are the devils. We are taught to hate ourselves for simply being born White. This is sick, but unfortunately a lot of people have fallen ill with this self-hate bug. Whites haven’t always been angels, but neither have we been devils. That’s why it’s wrong to destroy White majorities (White genocide). We have a right to exist just as much as any other group on this planet. This just goes to prove that all these “anti-racists” are in fact just evil, pathetic, anti-Whites hiding behind nice words. 'Don't Tread on Me' now racial harassment? (FOX NEWS) Wearing a Gadsden Flag hat to work could be considered racial harassment, according to the Equal Employment Opportunity Commission, the government body that oversees “hostile work environment” harassment claims against federal agencies. The iconic flag, which originates from the Revolutionary War, features coiled snake above the words “Don’t Tread On Me.” In recent years, it has become a favorite symbol of the Tea Party movement and conservative activists.